This post will contain some spoilers so if you are not up to speed on volume 1 click HERE to get yourself caught up. 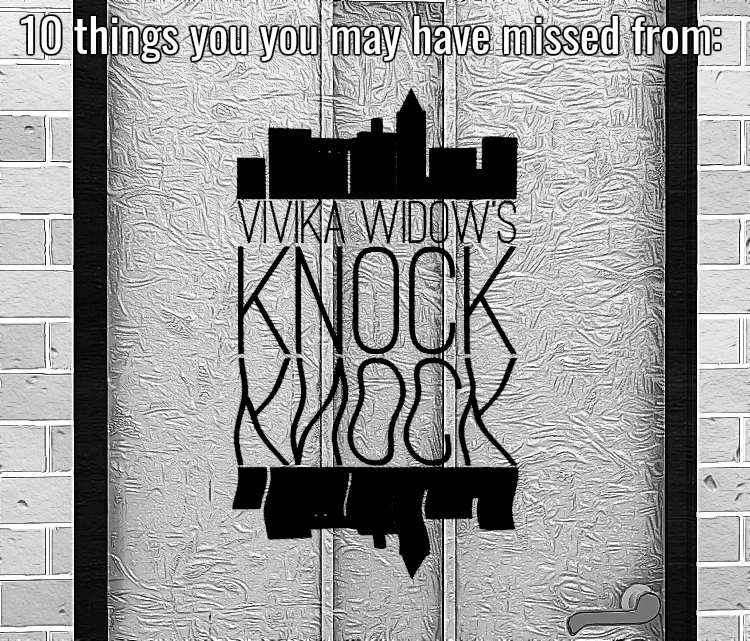 Now that that’s out of the way let’s take a look at ten things you (probably) missed when reading Knock, Knock Volume 1. The seventeen year old daughter of the city’s mayor didn’t really have a great start in our opener EP 1 WELCOME TO THE CLUB did she? We all know what happens next (#prayforamber) but what you may have missed is what brought her to that point in the first place. She is an impulsive girl and despite being warned against it by her more sensible elder sister, Amber just couldn’t stay away from the Knock, Knock Club. Click HERE to follow Amber’s journey in the exclusive mini story MEMBERS EAT FOR FREE. In EP 3 SLEEP TIGHT SAM our reporter returns to the Knock, Knock club. Before he can get any information from our delightful club manager, Dennis is distracted by a call from a young woman. It is revealed that the girl calls often and she seems a little distraught about something (more details later). Later in EP 10 CALLING LAST ORDERS we meet the cute but ill Chloe as Dennis tries to make a break for it. What you probably didn’t realise is that Chloe was the young girl who had been frantically calling Dennis. Her sordid relationship with Dennis was revealed in the mini story NO TOYS IN THE ATTIC which you can read by clicking HERE. There are a lot of landmarks around the Shady City. Few of them stand out as much as the stadium of Coldford City Football Club (or soccer to people from certain parts of the world). We met star striker, Andre Luis, in the mini story PLAY THE GAME which you can read by clicking HERE. What eagle eyed readers may have spotted is that Coldford City Stadium sits behind BOBBY’S LUNCH BOX where our reporter met his colleague and friend Madeline to discuss his findings in EP 3 SLEEP TIGHT SAM. It isn’t until EP 10: CALLING LAST ORDERS that it is finally revealed who has been helping and their reasons. It seems some thunder was brought after all! In EP 7 NO KIDS ALLOWED and EP 8 KIDS THESE DAYS we are introduced to the origin of the Knock, Knock club. There is of course plenty more of this to come in Volume 2 but what you may have missed is that the club has been subject to attacks. It has been burnt out by a gang of youths (more on that later) and most of the members died or disappeared. Take note of this folks because there is a war brewing and it is going to escalate. It seems our Knock, Knock boss lady, Tabitha, has a personal resentment towards the elusive Judge but it has not yet been revealed what that is. It is suffice to say though beware of the judge lurking in the background. When the gavel falls it will fall hard. Prepare yourself and check out our profile on Judge Doyle’s Law Makers by clicking HERE. In EP 9 SHOOTING THE BREEZE we meet sweet little Sarah. She is on the way to the park with her father, it is a beautiful day in the Shady City but like most things it won’t stay that way. Yes I know, #prayforsarah. Anyway, before she is taken towards the end of her part in the story those who are paying close attention may have realised that she has a remarkable resemblance to someone. We met bubbly Knock, Knock barmaid, Lisa, in EP 2 DON’T COME KNOCKIN’ and her connection to little Sarah is revealed in EP 10 CALLING LAST ORDERS. In EP 8: KIDS THESE DAYS in a flashback we have the pleasure of meeting Dennis’ wife, Olivia. She is kind, considerate and honest which seems a rare thing to find in the Shady City. However, by the end of the episode Olivia has left and taken Dennis’ baby son Milo with her. Olivia still has a lot to say and a part to play in events so we won’t discount her just yet. Her whereabouts are sketchy at best but if you read between the lines it will become clear where she is and why she left in the first place. The opening events in the series take place at the old building of the Beckingridge Financial firm. The Beckingridge family are the employers or our music teacher, Vincent Baines. It is through them the events of Maestro take place. If a suspenseful psychological thriller sounds like your cup of tea then click HERE to read MAESTRO. It is free to download for kindle unlimited users! He’s our gunman from EP 9 SHOOTING THE BREEZE but his appearance is so brief you may have glossed over him. Although we can’t confirm his persona just yet (all will be revealed in Volume 2 promise!) we can tell you that he is a member of the elite fraternity Kappa SO. No one brings anarchy quite like the boys of KSO so we are sure of a blood bath. You can learn more about Kappa SO by clicking HERE. Oh and those youths who burned out the Knock, Knock club? Could they be frat bros? Find out in Volume 2. So there you have it folks. If you enjoyed the Knock, Knock series please leave your comments. Let us know what you are looking forward to in Volume 2. Complete Volume 1 is free to read here at Vivika Widow Online. You can also download for kindle by clicking HERE.